Ready this Ski Season! 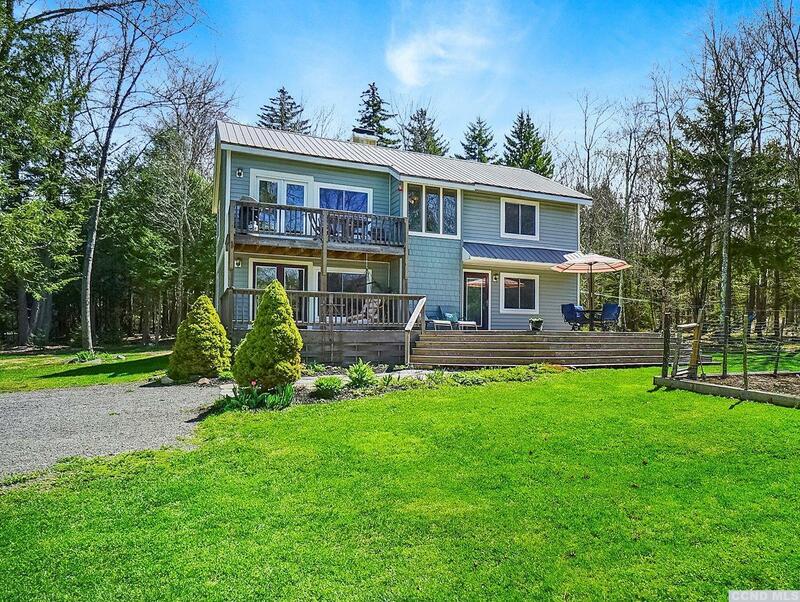 Stylish country contemporary in the beautiful Catskill mountains equi-distance to Hunter and Windham Resorts is in excellent condition, full of natural light and offers a unique open floor plan featuring two fireplaces. 1st floor entrance hall opens to nice sized family room with fireplace, set of glass doors open to large outdoor deck, 2 guest bedrooms, full bath with radiant heat, laundry/storage room. Vaulted ceilings on 2nd floor shares living kitchen dining rooms with fireplace in the center, glass doors open to balcony. Vaulted ceilings continue into Master bedroom with huge walk-in closet and new bamboo flooring plus a beautifully renovated bath featuring unique solid wood vanity top. Exterior in excellent condition- new windows, siding, new metal roof, spray foam foundation, french drains added in 2017, one car garage. Landscaped yard has fire pit, perennials, veggie garden, potting shed. Just a lovely 4 season vacation home. Big price cut- see now!